Amazon has a wireless Bluetooth speaker! This speaker has a built-in 2 x 40mm dual driver portable speakerphone with crystal clear sound and strong bass without distortion even at the highest volume. It can provide 30% louder volume and richer bass than other competitors. The crystal clear deep bass 6W HD loud speaker is perfect for both active outdoor and indoor use. 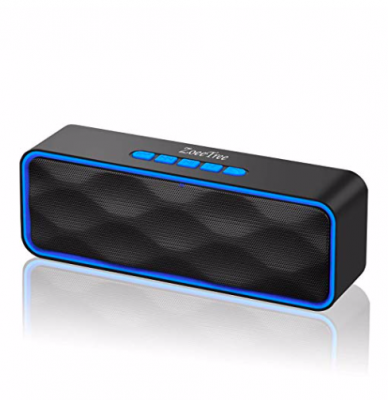 This wireless Bluetooth speaker connects over Bluetooth in seconds to iPhone, iPad, iPod, Mac, Smartphones, Tablets, Windows 7,8,10. To play on Chromebooks, TVs and non-Bluetooth devices use the included 3.5mm audio cable connected to the AUX-IN jack. There’s a built-in mic for handsfree speakerphone on Smartphones and iPhones. It plays up to 30 feet (10 meters) from any Bluetooth-enabled device. It looks like you missed the promo code for this deal. I’ll add a new promo code when I get a new one. You should check out my current list of Amazon Promo Code Deals. The current price is $16.99. Step 1: Click this wireless Bluetooth speaker link.